A Domestic Assault and Battery charge in Massachusetts will not be resolved quickly. Often, the parties are back together before the first court date, making it appear as though the charge will be quickly dismissed. But this is far from the case. Even if the alleged victim does not wish to go forward with the case, the prosecutor will still attempt to pursue the charges, relying on other evidence to prove the case. What happens if the victim DOES wish to pursue the charge? Many times the victim of an assault and battery charge may have a motive to fabricate the charges in order to get back at the accused. This sometimes occurrs during divorce proceedings, custody disputes or break up of relationships. If the victim does wish to proceed with the case, you will need to prepare a defense showing the motivation of the victim to fabricate in order to contest her testimony at trial. Self defense. In a self-defense case, a defense attorney can obtain prior violent acts of the alleged victim to argue that the victim was the aggressor. In the case of Commonwealth v. Adjutant, the Massachusetts Supreme Judicial Court allowed criminal defense attorneys to admit this evidence at trial to support a claim of self defense. Ulterior motivation to lie or try to use the criminal process for some improper purpose. In addition to potential jail time, a domestic assault and battery charges with it potentially restrictive probation terms including attendance at an anger management program or a certified batter’s program. The certified batter’s program is a very long and intensive program that is time consuming and is a very onerous condition of probation. A domestic assault and battery is a serious criminal charge. If you are charged with a domestic assault and battery do not talk to anyone, call DelSignore Law and schedule a phone appointment to discuss your case with either Attorney DelSignore or Attorney Julie Gaudreau. 1. Call us to set up a free, no-obligation consultation to discuss a domestic assault and battery charge. You can call Attorney Delsignore directly at 781-686-5924. 2. 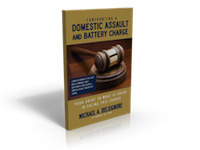 Download Attorney DelSignore’s FREE book on Domestic Assault and Battery Charges to read about your charge in more detail and get the answers to all your questions. Can I be held without bail for domestic assault and battery?